Every year the Greenfield Village opens up their park at night to host an old time "trick or treating" this is a great opportunity for parents and kids to get together and do something different during the Halloween season. Meet up and get on a party bus together with everyone and hit the Village together for this great celebration! The Detroit area comes alive with Haunted Houses during the weeks leading up to Halloween. Grab all of your friends and hop on a party bus to go on a Haunted House tour. 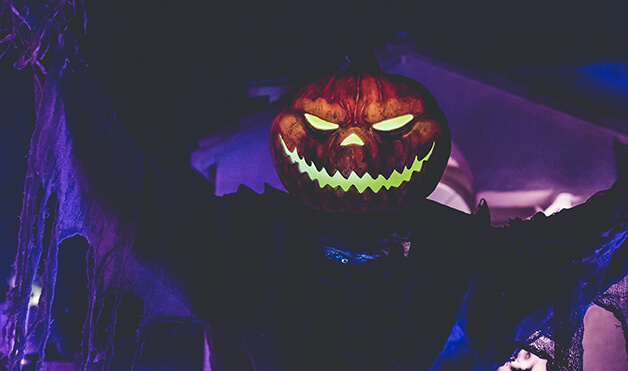 What could be more fun than cruising around town in a stylish limo bus partying with your friends, and then going and getting the wits scared out of you at the hottest haunted houses in the area? Just about every bar and club around town has some kind of Halloween celebration. As such, you would be right in style in your Halloween getups celebrating at the most popular places to be in the Detroit area. There really isn't a night more befitting the use of a Party Bus than Halloween! It allows the party to never stop, and keeps you from needing to punish select friends of yours in the form of being a designated driver. This is the one night, when everyone should have the chance to have a great time. The Halloween season is a time for friends and celebration! Leave all the stress of traveling during this great time of year to us. We can take you where you need to go, in more style than you can imagine!